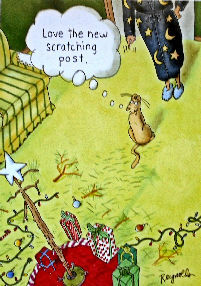 A cat is telling its owner "Love the new scratching post" while the Christmas tree lies in tatters. Inside greeting: Hope your Christmas is purr-fect. The cat Christmas card is 5" wide x 7" high. There are 8 Christmas cards and 8 envelopes in each package.